As a southern girl, it is my right – nay, my duty – to use copious amounts of cheese in my cooking. For me, this is not a problem. At all. Not only is my favorite food macaroni and cheese, but I really am a very big fan of cheese all-around, as you can tell from the sheer number of posts on this blog that involve cheese. My weakness when it comes to snacky foods? Crunchy, salty, savory, cheesy chips. I’d say it’s a tie for all-time favorite between Cheez-Its and Cheetos. Doritos and those Kettle Chips with New York Cheddar and Herb come in at a close second. So does it surprise you to see me using Cheez-Its to make dinner? It really shouldn’t. I thought you knew me better by now, dear readers . . . This chicken has a crunchy, tangy crust but inside it’s more juicy and tender than your wildest chicken dreams. Preheat your oven to 325 degrees. 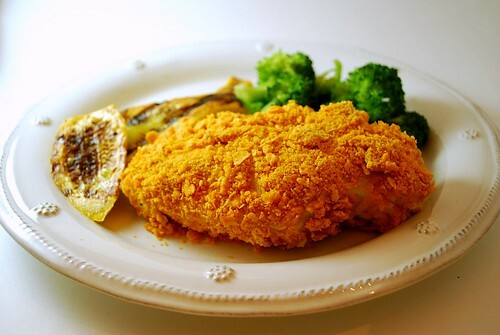 Grease an oven-safe dish that your chicken will fit in comfortably. Rinse your chicken breasts and pat them dry with paper towel. Season on both sides with salt and pepper, to taste. In a shallow dish, combine the sour cream and buttermilk. Arrange the crushed Cheez-Its in a second shallow dish. Dip each chicken breast into the sour cream mixture, then into the Cheez-Its so that they adhere and form a crust. 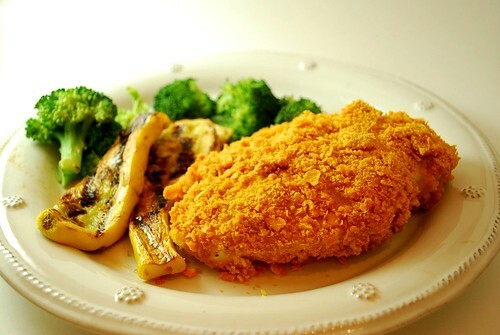 Place the chicken in your prepared baking dish, leaving about 1″ between the breasts. Cover with foil and bake for 45 minutes. Then remove the foil and bake for an additional 15 minutes. Enjoy!